Biển Salton là dạng biển nông, hồ nước mặn ở San Andreas Fault. 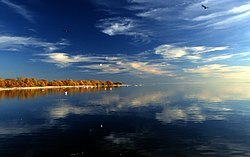 Metzler, Chris and Springer, Jeff – "Plagues & Pleasures on the Salton Sea", Tilapia Film, (2006) – history of the Salton Sea, and interviews with residents and naturalists. Setmire, James G., et al. (1993). 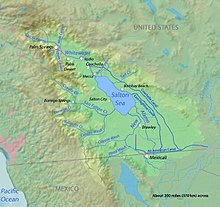 Detailed study of water quality, bottom sediment, and biota associated with irrigation drainage in the Salton Sea area, California, 1988–90 [Water-Resources Investigations Report 93-4014]. Sacramento, Calif.: U.S. Department of the Interior, U.S. Geological Survey. Sperry RL (Winter 1975). “When the Imperial Valley Fought for its Life”. Journal of San Diego History 21 (1). Greenfield S (Winter 2006). “A Lake by Mistake”. Invention & Technology 21 (3). Trang này được sửa đổi lần cuối vào ngày 22 tháng 10 năm 2018 lúc 15:25.